Bluet & Clover: Ooh la la! 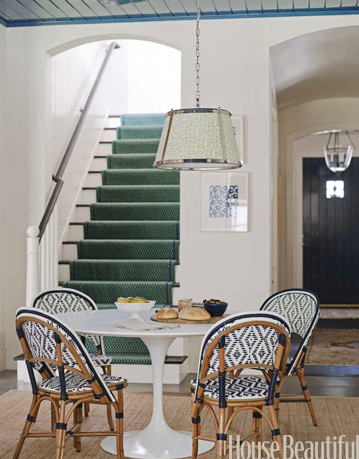 So I'm back to obsessing about dining chairs. I've seen these cute rattan chairs around and I love 'em. 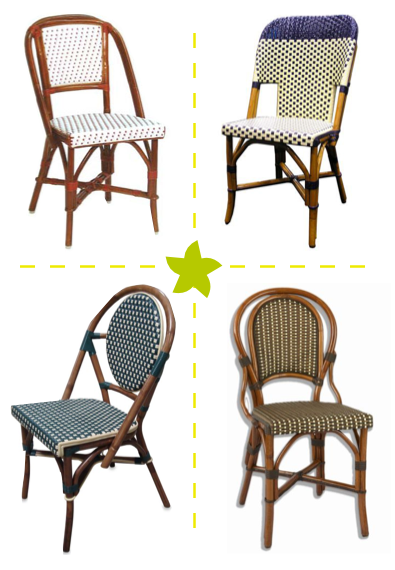 It took me a while to figure out that they're called French bistro chairs or rattan bistro chairs. After that discovery, I was able to do some Googlin' and find some retailers. It seems these chairs are available in the best colors and patterns through To The Trade Only sites, but I did find a couple of places where us amateur designers can order. Clockwise from top left: Ivory and Brown bistro chair $275 at Decor N More, Blue and Navy Glossy Weave chair $295 at Decor N More, Marais Rattan Bistro chair in bronze $265 at American Country Home Store, Green and Ivory set of 2 $239 at Bed Bath and Beyond. There were also several versions available here on Ebay. I have a feeling that if I wait a year or two these chairs will pop up at Pottery Barn, Target and eventually Overstock. I'm not ready to go out and buy new dining chairs anyway, so I think I'll hold out for some lower prices, although the BB&B option isn't too terribly pricey. 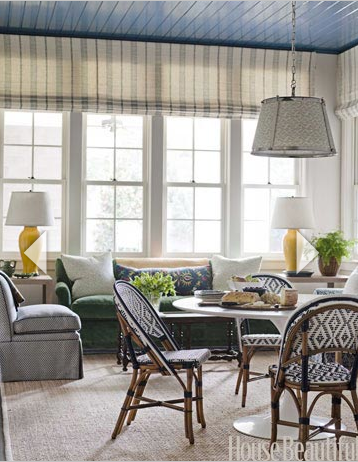 I love how these chairs look right at home in these sort of country kitchens. I already have some steel bistro type chairs for the kitchen, but I think these would make nice comfy dining room chairs, don't you think?